So it was a bit frosty this morning. I am hoping my plants survived it OK, I just planted 10 new things this past weekend. Sigh, this time of year is tricky. 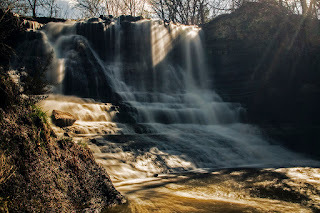 My image today is of the waterfall at the Geary State Fishing Lake south of me this Spring. I am always amazed that such a waterfall exists near me in a place you would not think would have an at least 30 foot high water feature like this. When it rains it is just beautiful. I captured it this day in late afternoon sun and i like how the light rays played into the image.